Allenwood is a yarn dyed men&apos;s country check shirt, with a patch pocket and hidden button-down .. Perfectly breathable and crisp for smart or casual, the Harlington Shirt has tonal inside collar and.. 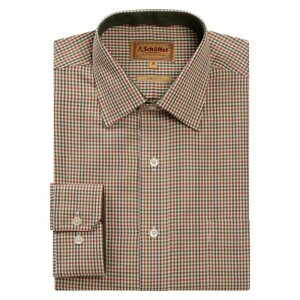 Perfect to pair with trousers or jeans, this cotton Oxford shirt is a wardrobe staple that you&apos;.. This classic fit indigo check shirt is easy style at its finest. When worn with trousers or jeans, i..
Crafted from summer-loving linen, this new classic fit shirt will be a great addition to any man&apo..
On the colder days this season reach for the Stoltz long sleeve fleece lined shirt - an ingenious sh..
Classically tailored and beautifully finished 100% cotton shirts in a classic check design with tona..
Classic Tattersall Shirt made from 100% Cotton, available in two multi colour check pattern. The col.. 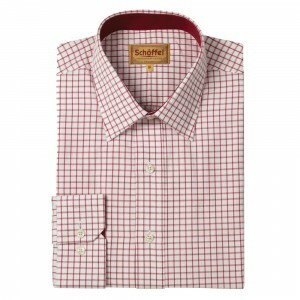 The Schoffel Brancaster Shirt is made from lightweight, crisp cotton for year-round comfort and brea.. The classic check design is timeless, making an effortlessly easy outfit, with a subtle pop of colou.. In a perfect balance of casual and smart, our new Matanic long sleeve herringbone check shirt is des.. Choose the Mayo Hawaiian short sleeve shirt this season and be dressed to impress. This is the ultim..
Our new Corrib gingham short sleeve shirt is our new, classically styled, 100% cotton shirt. The per..
Our new Blakely long sleeve gingham check shirt is a must have in any mans wardrobe.Team it with a g..